15 Hand Pumps constantly changing range, concentrating on small or craft breweries, probably the best Real Ale club in the country. Home of Dartford Folk Club. Dartford Working Men's Club in Dartford has a beer garden. The pub has a car park, it has disabled facilities. Dartford Working Men's Club is a family friendly pub. The pub serves food, it has a function room that can be booked. Dartford Working Men's Club has an outside area. The pub serves real ale, it has free WiFi. Dartford Working Men's Club has a dart board. The pub has DJ's, it has karaoke. Dartford Working Men's Club has live music events. The pub holds Poker Nights, it has a pool table. Dartford Working Men's Club holds quiz nights. The pub has a big screen, it shows football on TV. Dartford Working Men's Club shows rugby on TV. The pub has Sky Sports, it has terrestrial TV. 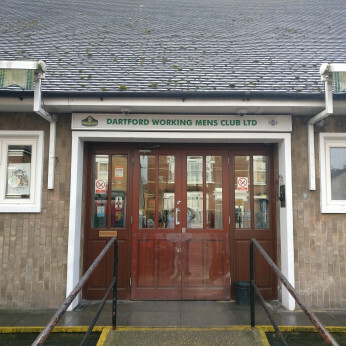 Dartford Working Men's Club is a member of the BII. The pub is a member of Camra, it is a member of Cask Marque. Dartford Working Men's Club is a members club.